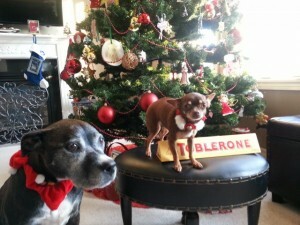 There is a lot of information out there about keeping your pet safe during the holidays and all the potential hazards. At Royal York Animal Hospital, we try to provide our clients with as much information as we can. After a while, especially if your pet is older or if you are lucky enough to have a “good” pet who normally doesn’t get into anything, it is easy to let our guard down a little bit. The fact is Christmas time is stressful for most pets especially because the two-legged family members are often busy and distracted…..and….. All this new stuff is around — trees, presents, decorations etc. 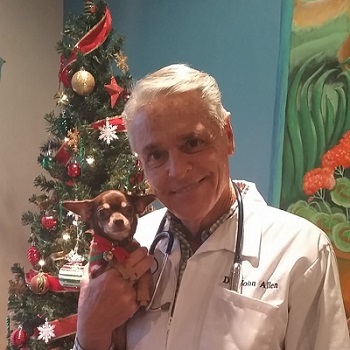 For a quick review check out the AVMA’s Holiday Pet Don’ts. When you are a Tech or a Receptionist at Royal York Animal Hospital you are very aware of potential Christmas Hazards for your pet right? You know all about Poinsettias causing gastrointestinal upset and tinsel on the tree being swallowed inadvertently by your cat. You keep the chocolate and other tasty treats way up high out of reach…. It was 2 weeks before Christmas……the tree is up and decorated and the presents are wrapped and beautiful are presents under the tree. Leila, was a 2yr old Chihuahua and Pepper was a 9 year old Staffordshire Terrier and their “mom” is one of our long term Veterinary Technicians. She had left them alone many times in her home and this time she was only out for a few hours. They were reliable and trained and had never before shown any interest in the Christmas decorations, tree or presents nor were they the type of dogs who steal food or try to get in the garbage etc. Returning home, she discovered both dogs had ripped apart and eaten one of the wrapped gifts under the tree which happened to be a 400 gram Toblerone Dark Chocolate bar, Hot Chocoate Packages and Shortbread Chocolate Chip cookies…….All completely gone!! Chocolate toxicity is one of the most common holiday hazard we see. Be aware that chocolate can be fatal. Next step for Leila and Pepper: Emergency treatment and IV fluids for 2 days saved these dogs lives! Thankfully both received supportive emergency treatment immediately and recovered uneventfully. Tinker was a 5 month old kitten owned by one of our receptionists. Everyday she talks to pet owners on the phone and in person giving advice about holiday hazards and organizes appointments for sick and injured pets who have had misadventures during the holidays. She paid special attention to her own decorations, that particular year, as she had a young kitten in her home. “Tinker”, in typical kitten fashion was into everything and climbing everywhere! So, imagine the horror of coming home to find that Tinker had climbed up the artificial tree and got wedged between the branches and lights and almost strangled to death. 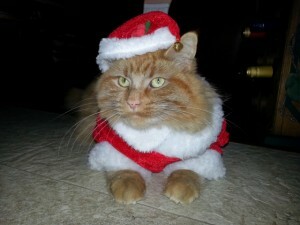 This is “Theo” who has been a very good kitty this year. I can’t stress enough that these things can happen to any pet! Check this out for tips from one of my previous blogs. Check this link out to read Dr. Suzie Jerabek’s blog about the specific dangers of home-made decorations, small children and pets. 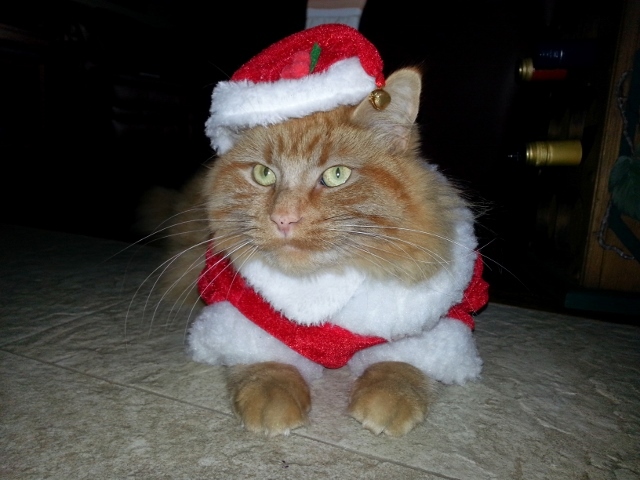 Christmas is around the corner…….please keep your home safe for your pet !